Continuing with the Austin skyscraper theme, here’s the Austonian, among others, during the peak blue hour. 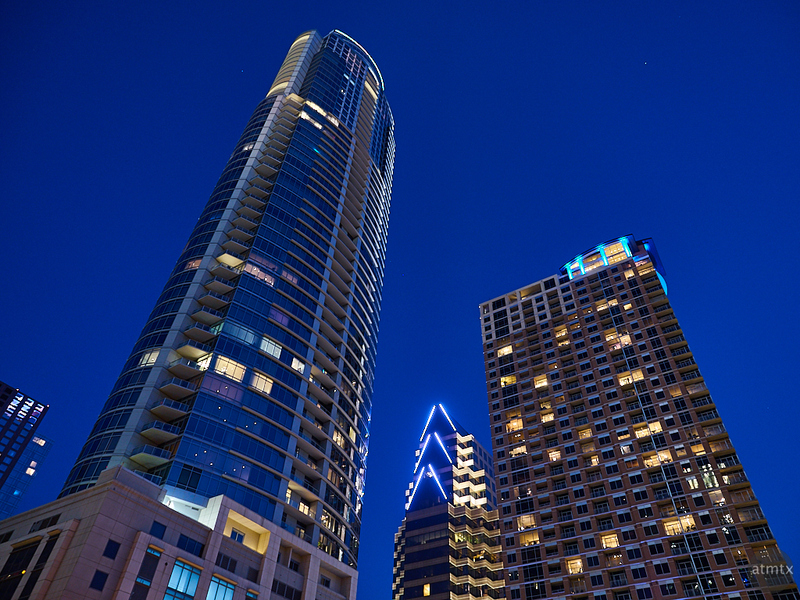 The Austonian, an all residential tower, is currently the tallest building in Austin and also the tallest all residential building west of the Mississippi river. It will remain the tallest until The Independent, edges out the tallest title, when finished sometime in the future. I shot this a week and half ago, with the Olympus PEN-F and the 12-40mm f2.8 pro lens, with an extremely slow shutter speed of 1/1.3 per second, to minimize the ISO. There is a method to my madness with I will explain, most likely tomorrow. It’s part of an experiment that I’m doing, which will all become clear. The Olympus in body image stabilization enables me to shoot with extremely slow shutter speeds. Ultimately, to improve the image quality. Image stabilization works much like a tripod, where it offsets the shake induced by handholding at slow shutter speeds but does nothing to slow down the action. It works well in this case, because the scene is not moving. It’s not as effective in action scenes, unless you purposely want to induce motion blur. Beautiful shot Andy. Wish I would have been with you. The weather has been great lately. Thanks, Jerry. Yes, we’ll have to go out and shoot together. Just got a M1 Mk2 can’t wait to try it out. Very nice. We definitely need to go out shooting together. Neat shot. I sometimes wish my Fuji camera had in-body IS. The in-body IS is a real strength of the Olympus, which I rely upon all the time.